Mitchell Starc has been declared “right to go” by Australian teammate Nathan Lyon, with the express paceman set to overcome a sore calf and play the third Test against South Africa. 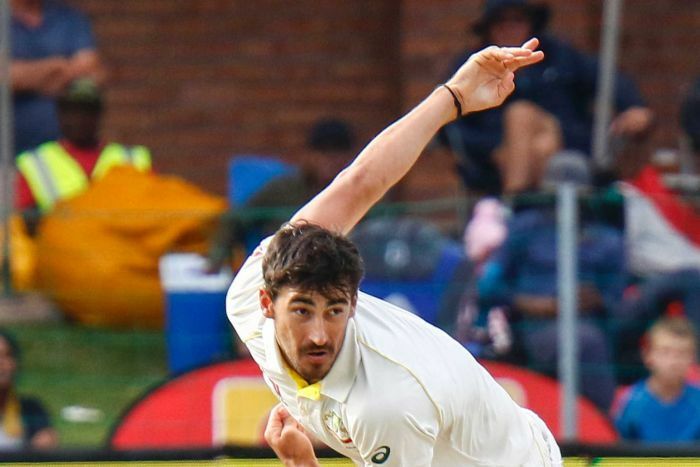 Starc was clearly bothered by some form of niggle during South Africa’s second innings of the second Test, but at the time suggested it was nothing serious. The left-arm quick, who missed the Boxing Day Test against England because of a bruised heel and was also bothered a stress fracture in his landing foot in 2017, was restricted to batting duties during the tourists’ first session in Cape Town. But the 28-year-old made a statement of intent on Tuesday, terrorising teammates in a fashion that suggested he will be strolling out to Newlands when the four-Test series continues on Thursday. “He [Starc] is right to go, [Cameron] Bancroft was saying he was bowling very quick,” Lyon said. “He’s perfectly fine. I’ve got no worries about him pulling up OK.
“He was on the golf course [on Monday]. Mitch Marsh, who suffered a groin strain in Port Elizabeth, also bowled on Tuesday and appears a certain starter for this week’s clash at the foot of Table Mountain. Starc’s importance to Australia’s hopes of winning the series, currently level at 1-1, has arguably been magnified by the fact Kagiso Rabada had his two-Test ban overturned. If Starc was an enforced omission, selectors would have to blood either Chadd Sayers or Jhye Richardson. Starc needs only watch footage of Australia’s most recent Test at Newlands, in 2014, if he is seeking inspiration. Ryan Harris bowled Australia to a famous series victory four years ago, having delayed much-needed knee surgery to take part in the tour. Harris struggled to walk during the match and needed fluid drained from his knee, but delivered two late wickets to ensure the Proteas did not salvage a draw. “The way it panned out with Ryan Harris basically bowling with one leg, and bowling Morne [Morkel] with about two overs to go was exceptional,” Lyon said. “It’s obviously coming to the end of a massive summer for us. For the bowling squad to have played the majority of the games has been exceptional. ‘I know the boys are up for these two Test matches, but they’re also looking forward to a break.